It was not until the summer of last year that I finally decided to go full frame, and purchased a second hand Leica Monochrom. I had previously used APS-C (Nikon) and Micro 4/3rds (Olympus) cameras. One of the principal reasons for my decision was the potential to use minimal depth of field more creatively in my work. The combination of a full frame (35mm) sensor, coupled with a large aperture, has given me photographic opportunities which were simply not possible before. However just blurring the background doesn’t necessarily giving a pleasing result. The out of focus areas are still important to the overall appearance of the image. Blurred shapes, tones and arrears of light of shade still influence how the image is viewed, even though the eye may initially be drawn to the main subject of the picture which is in sharp focus. The main photograph I have included in this entry is I think a good example of what I am trying to say. Taken on my recent trip to Snowdonia, the bright early morning sun was shining on small area of bracken in a wooded glade, whilst a path in the middle ground weaved its way down to the waters edge of Llyn Dinas. I tried to visualise how the background elements of the image would be rendered when out of focus and whether or not the shapes of the trees would enhance the overall composition. You can of course try and visualise what the image might look like if everything had been in focus. I didn’t take a shot with a small aperture opening so I cannot make this comparison. My feeling is that there would be too much going on. The foreground and background would be fighting for attention. 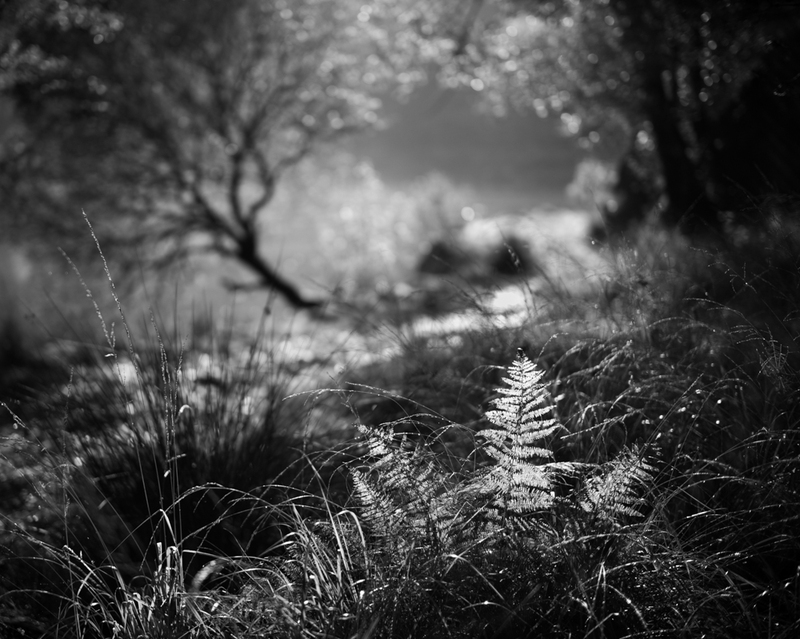 By using a narrow depth of field I have been able to isolate the sunlit fern which is the principle point of interest. The blurred background informs the viewer about the setting, complimenting the main subject and enhancing the overall appearance, but in my opinion it is no longer a distraction. 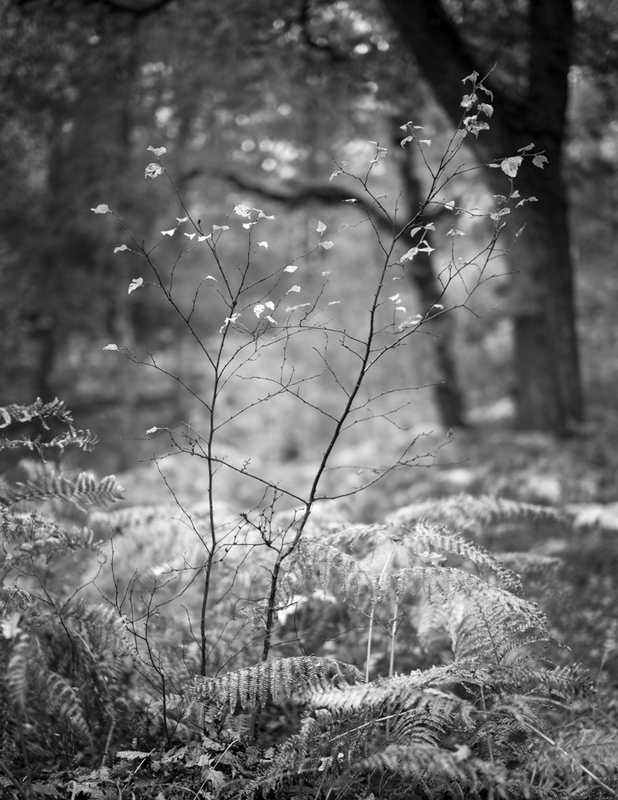 Here is another example – This image was taken in the woods near Capel Curig. I am not saying there isn’t a place for landscape images which are very sharp from front to back. I take a good many myself, but increasingly I prefer to shoot wide open (50mm at f1.4) and by doing so I add another dimension to the composition, which until last year was not possible. Click on either image to view a larger version which will open in a new window. By doing so I think you will appreciate the photograph just that little bit more. Thanks Skip. Can I just say how much I am enjoying your ‘family’ series. I do hope you will posting more very amusing images and words in the future. Beautiful images and perfect examples of your explanation. I must say, I learn a great deal from your blog. Thank you for sharing your expertise in Black & White photography. I tend to always shoot in colour and convert some on the computer as I still can’ t really ‘see’ what makes a great B & W in the field. Could be my extreme myopia, but on the other hand I can actually see the various shades from Black to White easily enough, so one would think I could guesstimate. Thank you Vicki. I am encouraged to know that you find my blog informative. I think that by shooting almost exclusively in mono, plus the fact that my camera only records luminance and not colour, has helped to train my eye, and my mind to look at the world in black and white. The more images I take, the more I learn what works for me and what doesn’t. I am just pleased that my photographs can give pleasure to others as well.